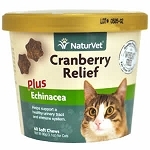 Cranberry Relief helps treat bladder infections in dogs and cats. 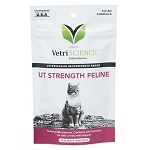 Contains natural ingredients to make urine more acidic and less hospitable to bacteria; helps to control urinary tract infections in cats and dogs. Cranberry Relief - Treat bladder infections in dogs and cats. 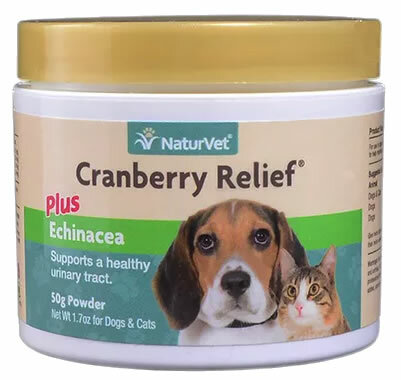 Cranberry Relief by NaturVet contains natural ingredients to make urine more acidic and less hospitable to bacteria; helps to control urinary tract infections in cats and dogs. Cranberry extract helps prevent bacterial colonization of the bladder lining. Marshmallow root is a natural antimicrobial. Oregon grape root is a natural antibacterial. Echinacea is a natural immune system booster. Ester-C makes the urine more acidic and therefore more inhospitable to bacteria. Each jar contains 50 grams. Also available in soft chews for cats and soft chews for dogs. My dog, a boxer, has had reoccurring problems with urinary tract infections and crystals in her urine. Our vet recommended cranberry juice but she would have no part of that so we are adding cranberry relief to her prescription food and she has been doing much better since. I bought cranberry relief for my cockerpoo mix because she gets urinary infections often. Just trying it now, but from the other reviews I think I may keep her on maintenance with the start of her prescription meds to initially get rid of the infection out of her and then constant maintenance. I am so glad I found this powder. 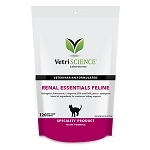 I have told other people to try it for their dogs/cats. 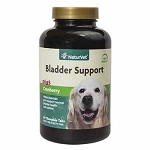 I ordered these for my elderly dog who has periodic cystitis. Historically she's pretty clever when it comes to sniffing out medication I try to sneak her, and becomes sensitive to the whole process of being medicated in general. But she has no trouble at all with this powder being sprinkled on her food. Fantastic! She loves it, I love it, and her frequent bladder infections have drastically diminished. Resultingly, her discomfort has gone way down and it's clear she's enjoying life more. I have nothing but good things to say about that! Thanks for the great product and the super fast shipping. Not sure if it works or not....haven't found a way for my cat to take it. I didn't realize it was a powder until I received it. Doesn't mix well with water it stays clumpy and she has no interest in it. If I add it to her wet food she won't touch it. Not sure what to do at this point. I'll give it a 3 for now. Ingredients: Cranberry Extract, Echinacea Purpurea, Oregon Grape Root, Calcium Ascorbate (Source of Vitamin C), Natural flavoring, Non-Fat Dry Milk, and Silica Aerogel. Note: Feed twice daily for 1 week up to 3 weeks. Then no more than twice weekly or per your VeterinarianÃ¢â‚¬â„¢s recommendations. Approximately 90 scoops per 50 gram container. To learn more, visit our webpage on Urinary Tract Infections.